Hey y’all!! We hope your week has been beautiful and blessed! Sorry friends! I’m desperately late with this week’s post, but real life kicked in and dealing with that has been time absorbing and stressful, but hopefully the outcome will be a very, very good thing for mum and I.
Anywho, welcome to week six of the One Room Challenge hosted by the fabulous Linda from callingithome.com and sponsored by House Beautiful Magazine! There is so much talent from the 20 invited decorators and designers and I’m one of the 175 or so guest participants that are allowed to link up our blogs and share in the challenge and fun of doing one room over in 6 weeks! There is so much talent and inspiration from everyone, so please stop by Linda’s blog and check us all out! Because of the storms and hurricanes effecting so many of the participants, the ORC hosts have extended the challenge this time, giving us an extra week to complete our rooms, so the room reveals will be next week! My toile wallpaper with fresh, bright, clean white paint and trim, so classic and pretty! Last week was wallpaper and trim, so this week it was all about paint, rugs and final furniture placement. For rugs, I decided to start with a large sisal colored rug that we already had. The adventure of laying this room sized rug in a room already full of furniture was quite strenuous and although we avoided melt downs during the wallpaper and paint, the rug install caused at least 2/3’s of a melt down! Lol! I ordered two rugs from amazon.com the first one arrived and though I loved it, I wasn’t sure if it was the “perfect” rug, so I uber shopped some more and found one that was a little more expensive, but I thought I might love more. It arrived last week and I do really love it, but I also love the first rug too, so I decided to use them both for a more relaxed, layered bohemian feel. 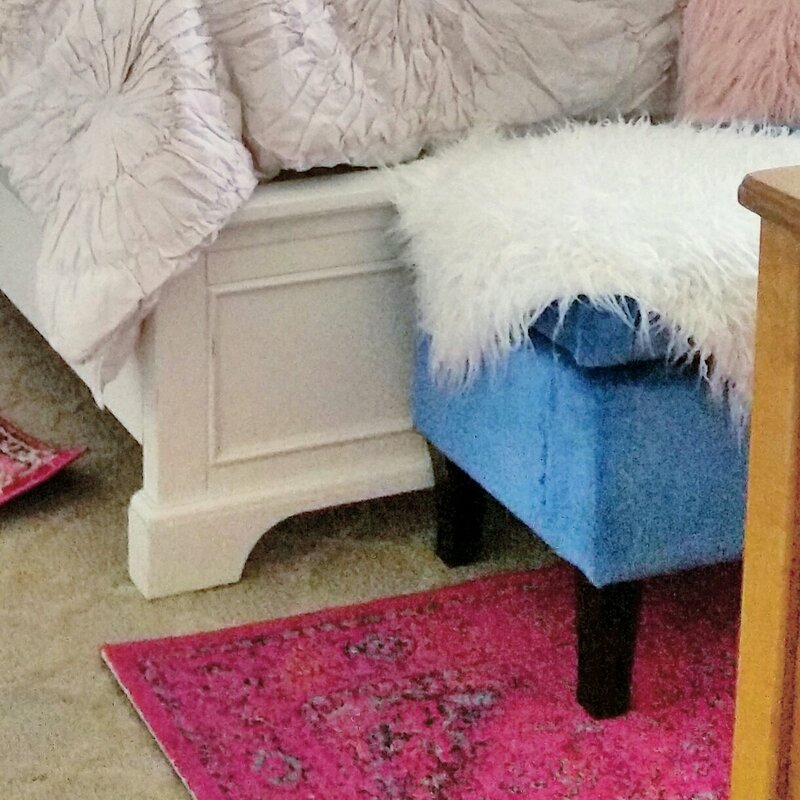 New ivory bedding, pink rugs and blue velvet covered bench. The new ivory bedding is beautiful, but since I ordered it late, I was only able to get 1 matching sham, so I ordered a pair of ivory matlesse shams from the same site. I’m mixing the ivory shams with white rouched shams that I already have and I love how the different neutral textures are making a beautiful backdrop for the blue and pink accents. Azure blue velvet my happy accident. I’m very happy to report that although I used the hot glue gun ALL day reupholstering the little storage bench at the foot of my bed, I didn’t get any major burns and no else was harmed in the process either! And the blue velvet I used turned out beautifully! 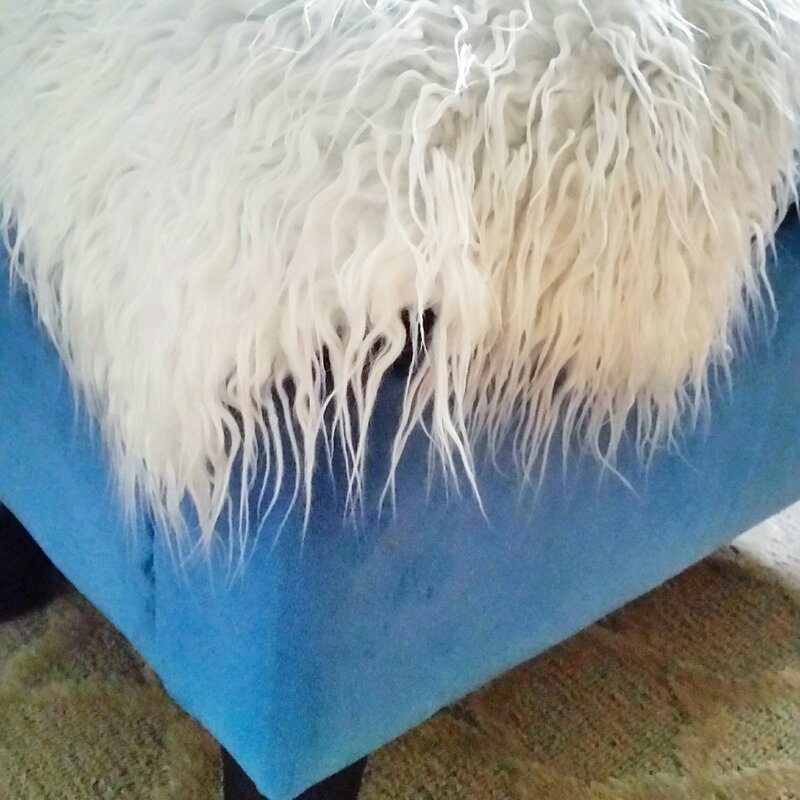 I was actually looking for a deeper more royal or sapphire blue, but it was a happy accident that it’s a pretty azure and matches an old favorite pillow and my new rugs perfectly! Created a little chandelier action for the old ceiling fan. I had fun blinging up a crystal bowl shade for the ceiling fan with some chandelier fobs that I found on amazon for $9. We decided that since we may be moving soon, the barn door sliding closet doors and drapes could wait for our new home, so those won’t be getting installed this time. I’m a little sad about that, because I think they would have looked so fabulous in this room! 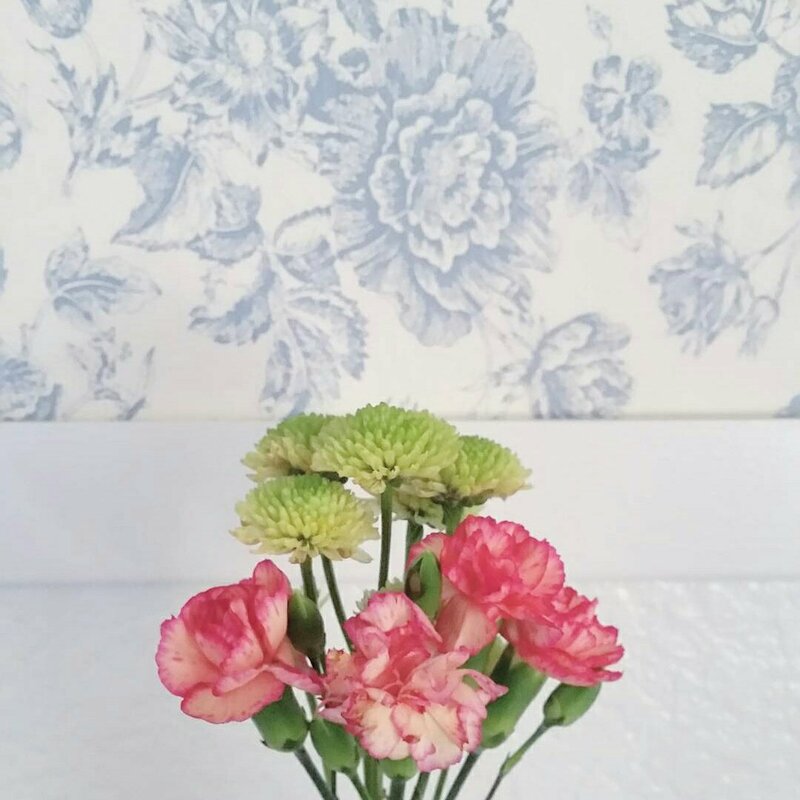 But I’m also sad that the beautiful blue floral toile wallpaper will get left behind in our move too, so it’s a decor Catch 22! Friends there’s gonna be a lot going on in our lives this coming week, but I’m hoping to make some new pillows and get all the finishing touches done early for the bedroom reveal on Thursday. It seem’s that like people, life is like a box of chocolates, you can never expect what you’re gonna get, and its a whirlwind when the Lord starts releasing everything to come together too! It’s like you’ve been waiting so impatiently, only to find that you’re not quite ready for how fast everything goes when it does start to happen! “Throw all your anxiety on him, because he cares for you.—1 Pet. 5:7. Please take good care of yourselves and your loved ones sweet friends! Hope you have a wonderful week and we’ll see you again soon! Thank you so much!! It’s hard not to share everything, but it’s fun giving the little glimpses of everything too!